Established, deep rooted shrubs seem to cope. I have been digging up the soil, breaking up the clumps of mulch, then adding cow manure and watering it in. I then continue to aerate the soil and it seems to stop it. However, I am worried that I may be spreading the problem. What is causing the problem? How do I solve it? I don’t use many chemicals in the garden. However, I have been recycling the laundry rinse water (with as little laundry liquid as possible) and using a collection bucket in the sink for emptying the tea leaves and rinsing my hands and things. This water gets rotated around the garden. The only other watering my garden gets is rain. Reply: Don’t worry about your watering – you are doing the right thing. Keep adding tea leaves. There are a number of decay or saprophytic fungi that love feeding on woodchip, and a few species can really develop extensive growth where a single kind of wood is used for mulch. They thrive amongst pine and eucalyptus mulch. Deep mulching (above 10cm deep) and regularly adding fresh woodchip increases fungal growth. While relatively benign fungi in themselves, especially in forest leaf litter, heavy mulching promotes dense growth of fungal threads (aka hyphae, see image). 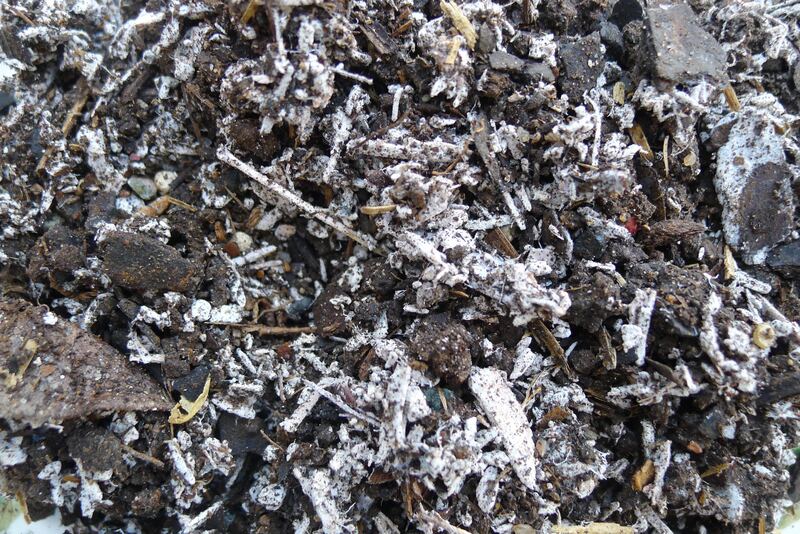 These threads bind mulch particles together, forming extensive, solid mats. The fungus-infested mulch becomes increasingly water-repellant and makes it harder for air to freely percolate through the mulch into the soil. Plant roots must get their oxygen from air pockets in the surrounding soil, so roots suffocate, desiccate, and start losing their ability to defend themselves against disease. One exceptionally bad instance was a large, two year old landscaped garden in the Brisbane suburb of Bunya where every border had turned into a ‘fungus factory’. Those fungi had altered from being passive digesters of woodchip into active invaders of dying root tissue, digesting the plants they were killing. The garden owners had lost everything they had originally planted and then the lost everything they had used to replant. They were alarmed by the losses, the cost, and the apparent futility of gardening in their new home. The only survivors were mature trees and palms that had been well established prior to relandscaping. You have observed the same in your garden. Mature trees and palms have extensive root systems in soil where these fungi haven’t got mulch as a food source. Please wear a dust mask when breaking up the mulch, you will avoid any risk of inhaling fungal spores. It’s safest to do this work when there’s a breeze. Breaking up this solid mulch-fungus matrix and adding manure accelerates composting, plus it introduces other micro-organisms which then compete with these few specialist wood digesting species of fungi. This will gradually protect your plants. I encourage you to water weekly with seaweed solution in dry weather. In wet weather, foliar feed the garden and dampen the mulch with seaweed solution. Seaweed contains alginates, natural wetting agents (compounds which make fresh seaweed feel soft and slimy) and these greatly assist moisture to penetrate the soil. Seaweed also stimulates biological activity in soil (and in any added compost or manure) and this gradually re-balances soil life. Do not add fertilisers at this stage, they can make plants more stressed. In the long term, prevent this problem by varying the type of mulch you apply every time you mulch. Soft, green, leafy material (like lawn clippings, soft leaves) are nitrogen rich and feed bacteria and protozoa. Dry, woody material (like teatree mulch and woodchip) are carbon rich and feed fungi and protozoa. Fresh powerline prunings are useful (and often abundant and cheap) because they contain a mixture of leaves, shoots, twigs and bark and consequently feed all microscopic soil life. In my ornamental garden (2003 – 2014) I have mulched with mushroom compost, then powerline prunings, then pine bark, sugarcane, teatree, lawn clippings, and sugarcane. Currently it’s mostly mulched with horse manure. By varying the mulching material you favour different groups of bacteria, fungi and protozoa and it is this diversity which helps avoids certain fungi getting things all their own way at the expense of plants. Reply: Do not drench the mix with fungicide, this will affect all kinds of fungi, including beneficial mycorrhizal fungi which assist with plant nutrition and defence against disease. Australian potting mixes use a large volume of partially composted bark. Bark is a cheap, abundant and lightweight medium. It is full of carbon rich cellulose and this is food for saprophytic soil fungi. In certain conditions, bark-based potting mixes these fungi can fill the mix with masses of white fungal threads, just like woodchip. The mix looks and smells mouldy. Mixing in cow (or sheep or horse) manure, or home made compost into the surface of potted plants introduces a beneficial range of different fungi (including coprophilous fungi), protozoa and bacteria. These will compete with (and sometimes feed on) saprophytic fungi. If potting mix cannot be wetted, plunge the pot in a bucket of seaweed solution overnight, then drain. Water weekly with seaweed solution and, hopefully, in a few weeks you will have resolved this problem by restoring a more balanced soil ecology.